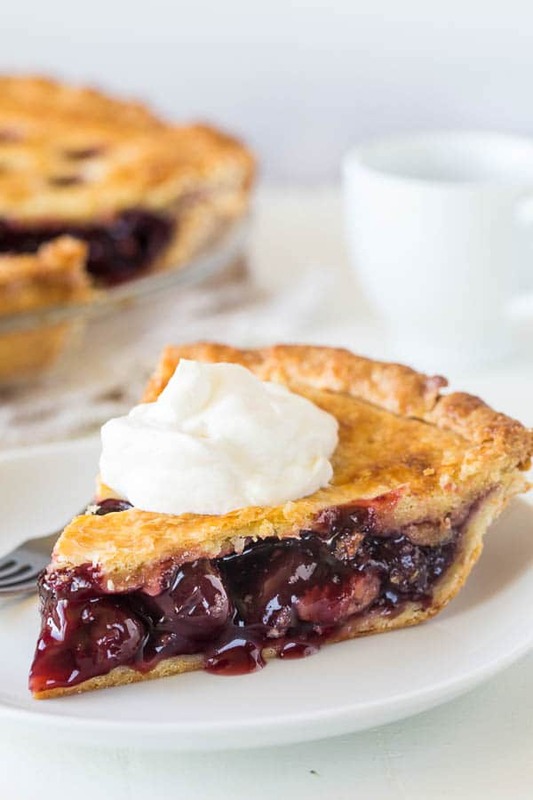 This sweet cherry pie is always a winner! Thick and sweet cherry filling and buttery flaky crust make one irresistible bite! 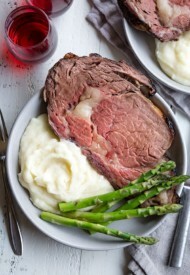 Plus, I shared 3 tips to avoid runny filling. Read on. I’ve said time and time again how much I love pies. Even though I didn’t grow up eating pies (at least not American kinds), my love for pies is deep. And one of my absolute favorites is this sweet cherry pie. It’s simple, it’s easy and it’s insanely delicious. One slice is never enough! 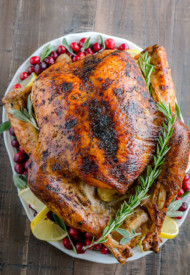 And this recipe is our family’s favorite. The filling is nice and thick, sweet and syrupy (not cloyingly sweet though), and with lots of whole fruits. Canned pie fillings stands absolutely no chance next to this homemade cherry pie filling from scratch. Just because the filling is from scratch, it doesn’t mean you’ll be slaving over it for hours. In fact, it takes practically no effort on your part. Simply dump frozen or fresh pitted cherries into a saucepan, bring it to a boil, and then add sugar, cornstarch and such, simmer for a bit longer and voila! It’s hard to mess up this cherry pie filling. Don’t forget the cornstarch. It’s the main thickening agent here and omitting it will result in super runny filling. 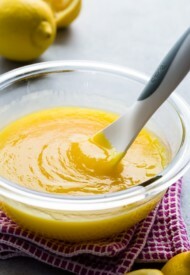 Lemon juice also helps with thickening the mixture. It’s not as crucial as cornstarch, but let’s just say you’ll notice the difference. Make sure to simmer the mixture to let it set properly. It usually takes about 5 minutes for me. Don’t forget to give a good stir frequently. Oh and as much as I love making pies, I really hate making a lattice. It sure makes an impressive pie, but it also takes an effort, and I don’t have time or patience for it. I just want to bake my pie and eat it! So if you’re like me, here’s my tip for relatively cute solution… Cut out polka dots using simple piping tip, like this one. Prepare your favorite pie crust, or as shown here. Divide the dough in half and wrap with plastic wrap. Refrigerate for at least 1 hour. Roll out one half into a 10 to 11-inch circle on a floured surface. Transfer onto 9-inch pie dish. Refrigerate the crust in the pan while making the filling. To make the cherry pie filling, place the cherries (if frozen, no need to thaw in advance) in a medium saucepan over medium heat. Bring it to a boil. In a separate bowl, mix together sugar, cornstarch and salt. Add sugar mixture, vanilla extract, almond extract and lemon juice into the boiling cherries. Mix well. Reduce the heat to low and simmer the cherry mixture stirring frequently until thickened, for 4-5 minutes. Remove from heat and cool for a few minutes. Bring out the other half of the pie dough and roll out into 9 to 10-inch circle. If desired, cut out small polka dots using a piping tip. 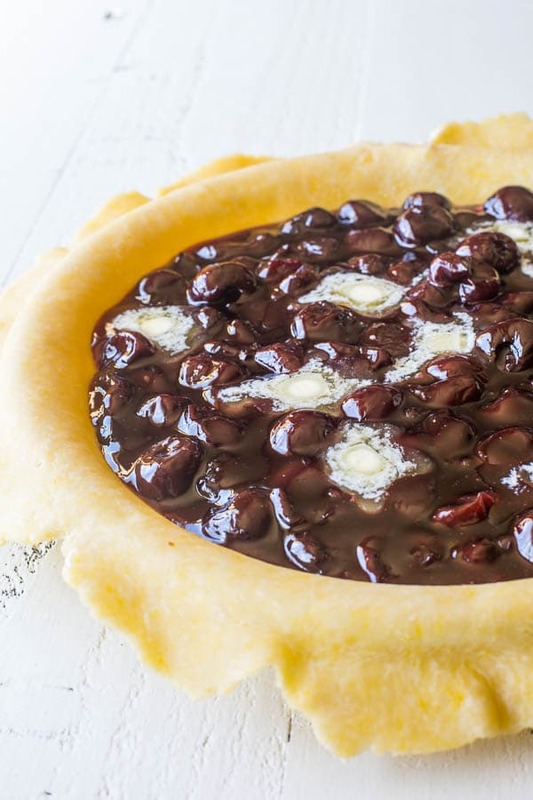 Remove the pie dish with pie crust from the fridge and pour the cherry filling. Throw in butter cubes in the filling. Cover the pie with top crust. Crimp the edges however you like. If you didn’t cut out polka dots, make 3 small slits in the crust for steam to escape. Brush on heavy cream all over the crust. And bake for about 45-50 minutes, or until golden brown. Let the pie cool completely before serving. Serve with whipped cream, or better yet with vanilla ice cream. This recipe was originally published on September 17th, 2013. Only fills the pie crust half way. Hi, Dennis. How big/deep your pie dish is? You actually don’t want to fill the pie dish to the top, it’ll overflow. Hope you at least enjoyed the flavor. Do you think this pie could be frozen unbaked? Hi, Kelli. I’ve never tried freezing assembled unbaked pie, so can’t comment on that. But you can prepare the crust and filling and freeze them separately. You can also freeze the baked pie. Just thaw it in the fridge overnight. Hope this helps. This is the BEST cherry pie ever. I grew up using sour cherries but not anymore! Yay, so happy you loved this cherry pie. Thank you for your feedback! Thank you so much for this recipe!! For whatever reason, I’ve not made a lot of pies in my life and I love to bake! This recipe is just wonderful and my pie is almost too cute to eat! So happy to have this recipe. Thank you for sharing it! Hi, Lisa! So glad you made this cherry pie. It’s one of my favorite pies. And I really need to bake one soon. Thanks for your feedback. Hi Shinee. I’ll send you the info about my cherry pitter in case I didn’t send it to you correctly before. I bought mine online from Amazon. It is the red one that hold 6 cherries or olives. You just put them in slots inside of gadget and press down with flat hand and they pop right out in container underneath. Just be sure to put them in stem side up. Count the pits to be sure you get them all, of course. It’s very easy and fun to use. It’s called the YouTensils etc. Happy cherry pitting. Mine are always found with 1 cherry that’s moldy! I’m having a hard time getting them fresh so then I have to throw out the whole pound. Do you ever have that problem? Yes, I found that cherry pitter. Thanks so much for the info, Linda! I do come across a bad cherry or two in a bag, but I never throw out the whole bag because of that. Just toss the bad ones, and the rest is good. Thank you so much for this great recipe. I’m making it tomorrow for the second time, because it is so good. I even purchased a cherry pitter that does a few at a time. It works so well that it’s almost fun to use. My family really likes this recipe. I love sweet cherries and now I have a really good recipe so we all can enjoy them.Thanks again and best of luck to you. Aww, Linda, thanks so much! 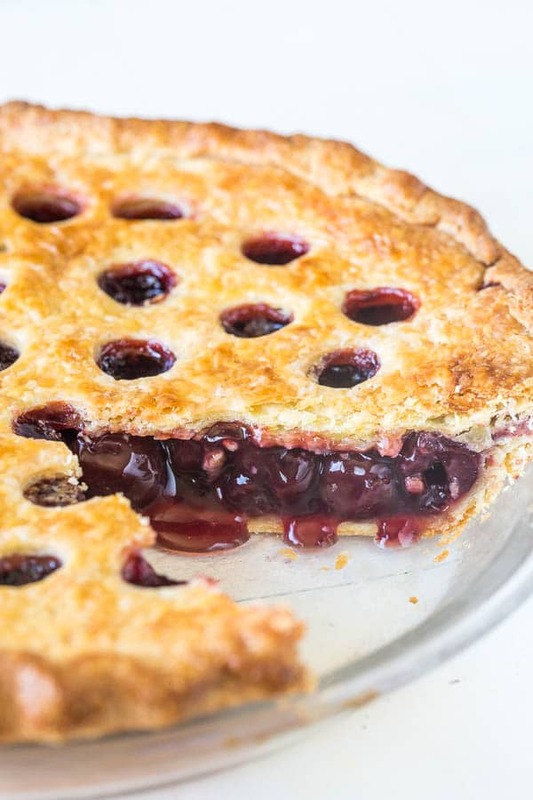 So happy to hear you’re loving this cherry pie! It’s our family’s favorite too. Please tell me more about your cherry pitter that does more than one at a time! I’m about to buy a case of cherries to freeze. And thank you for your feedback. Гоё харагдаж байнаа. Болдог бол зурагнаас нь гаргаж авахсан. 🙂 Мундаг бүсгүй юм аа. Бахархаж байна. Амжилт! looks like an amazing pie! Yes, it is so delicious! You should make it too. 🙂 Thanks for stopping by. Pie looks so yummy. I love crispy pie crust.